On Tuesday night we got back from a month long stay in Denmark. B and I went for a month. Frank was there for the last two weeks of our trip. We had a great time. 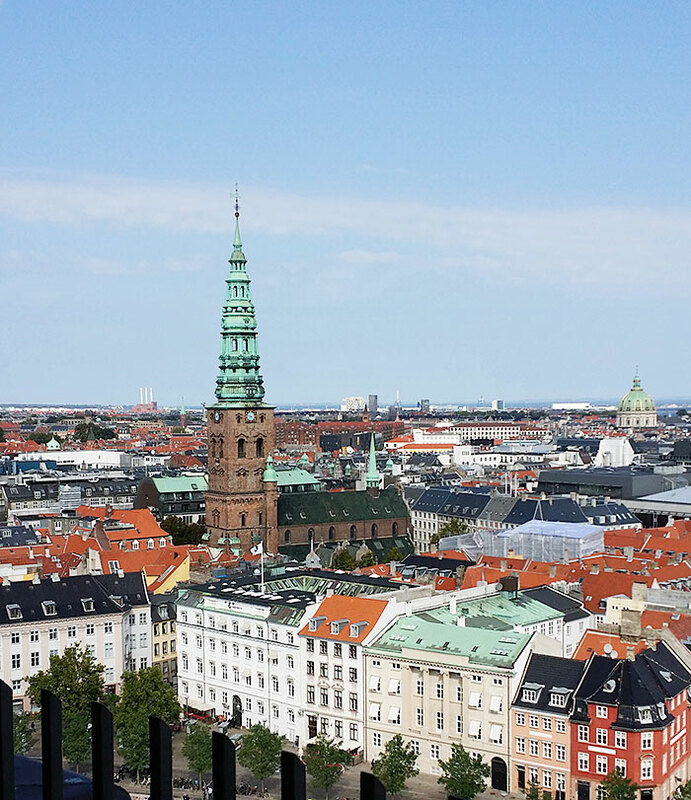 We celebrated my Mom's birthday and we took in some sights - picture above. We visited family and friends and it was great. I am working on a post to re-cap our trip. But let's talk bedroom progress. 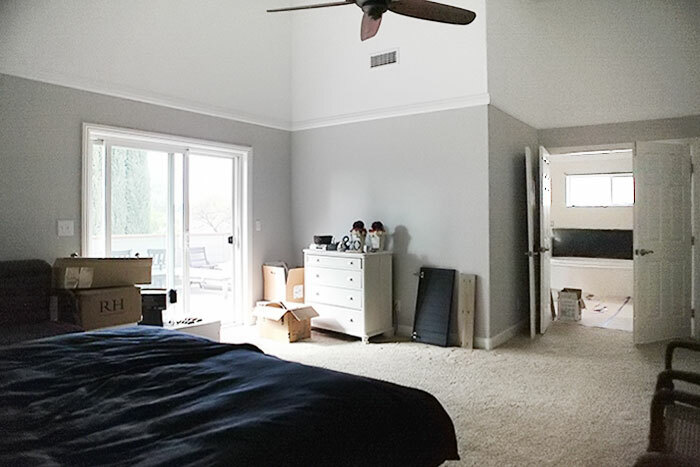 Last week, I showed you how big of a mess the bedroom was due to our bathroom remodel that is still in progress just next door. I snapped that behind the scenes picture on the morning of heading to the airport back in August. After returning, my first order of business was to clean out the bedroom. I sorted and put away all the clothes that was still lingering around the room from our walk-in closet renovation. That was a project we completed shortly before leaving for Denmark - except for flooring. Let me show you what the bedroom looks like as of now and show you the rest of it as well. I stacked all the artwork against the wall on the left. On the right are the cabinet doors for the vanity and seating bench tower. They will go in after tile is installed - more about that in a bit. This is the view opposite the bed. The wall on the left is the back wall of the walk-in closet. 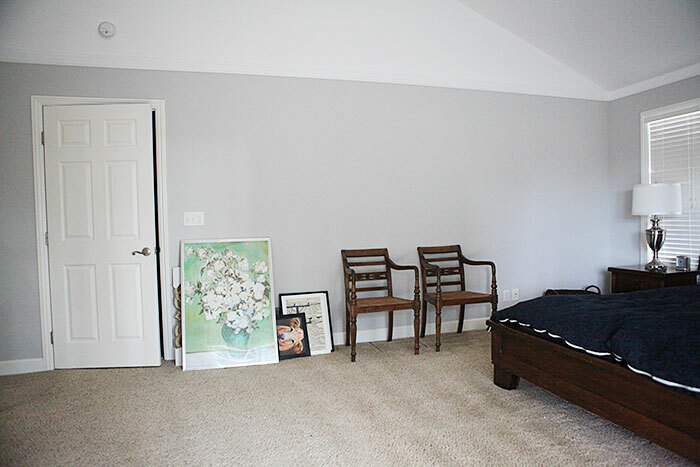 That dresser is going to move over to the right wall where the artwork is currently located. Then this is where the built-ins will go. In the background is the still to be finished bathroom. Those red poles have been holding the latest installment of cultured marble and will be removed during the next visit by the installer. As soon as tile has been installed on the back wall. Here is a slightly different angle of that same view. You can see the RH boxes over by the sliding door. Inside are the sconces we got for over the vanity. Next to that is a box with one of the two sinks that will go in as soon as tiling is done. Sensing a theme? Tiling needs to get done! And here is the wall you see when standing by the sliding door. That door goes to the hallway with cabinets. 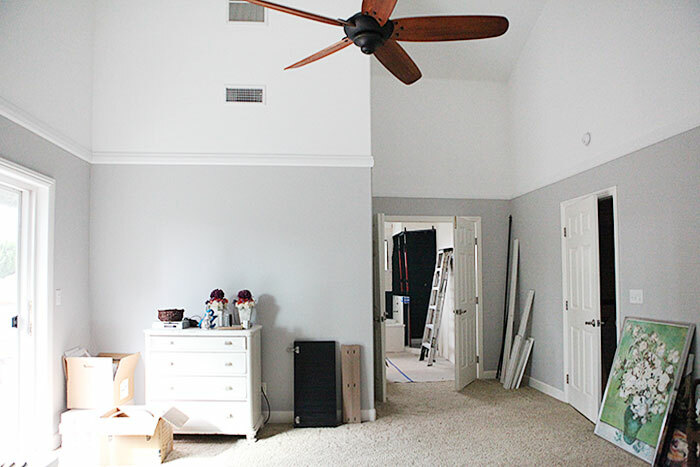 When the flooring gets installed in here, it will also be installed out there as well as in the walk-in closet. In addition to clearing out the bedroom, I have also been working on getting a few of the bigger projects off the ground. We really want to get the tiling going (haven't you heard?) and possibly getting that done before the hardwood floors get put in. This week I called a floor installer and got an idea about price and I had a tiler come out and have a look at the bathroom. The tiler came back with a written estimate on Friday that we are currently considering. 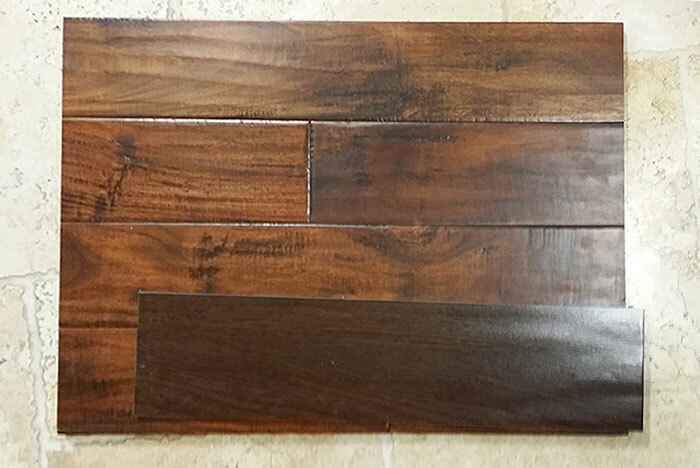 This weekend, we went to Floor and Decor - a huge tile and flooring store in Santa Ana. Looking at even more tile. Not finding anything better. 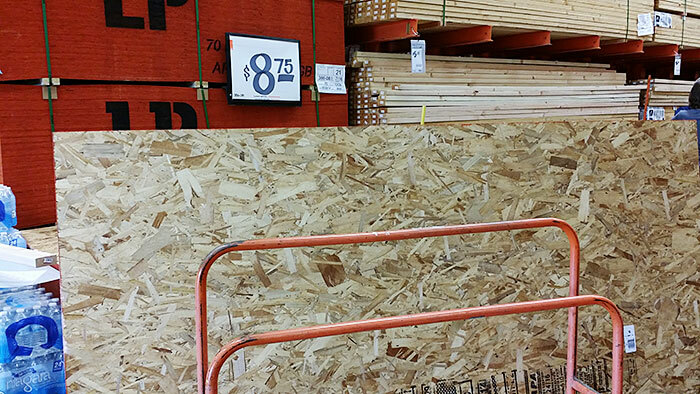 We also went to Lowe's and Home Depot and looked at what they had - again. The tile in the picture above is from a small local store in San Juan Capistrano. I called them Friday and Saturday, but they didn't pick up, so I am going there this week to see if they are still in business (crossing my fingers), to order that tile. It's been my favorite tile out of all the ones I have seen. Ok, enough about the floor and tile. While at Home Depot we got a board for the head board insert. On Wednesday, I called the foam store and B and I went up there the next day after they had foam delivered and had our foam pad cut for the headboard. Isn't that a nifty cutter he has (above right). It cut through that foam like a hot knife though butter. Even though the bed and the mattress are both 'California King' sized, for some reason the mattress is about 4-5 inches shorter than the bed. Until now I have had two king shams stuffed down there to make up for the difference, but that doesn't look ideal, so I want to fill that space with the headboard insert instead. This is the pattern I am going to use for tufting the headboard. Quite revolutionary, I know. 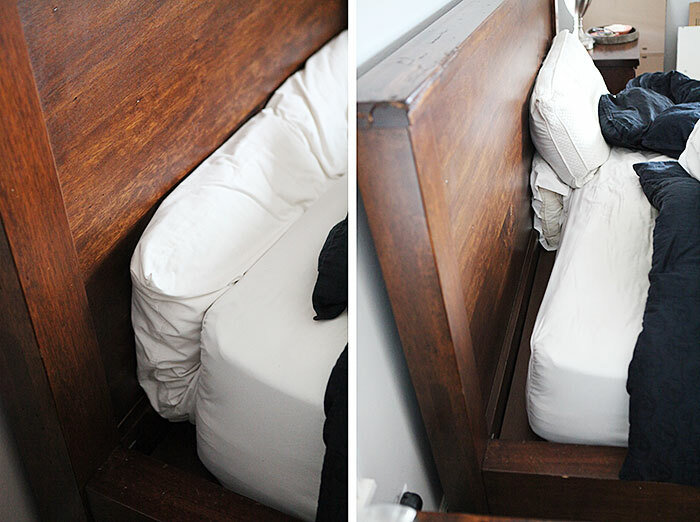 I am leaving off the bottom most row as that will sit behind the mattress. I will be following my headboard tutorial for this project. I started photographing the chair as I went so that I could put it back together later. Then I noticed one of legs... See above right. See how there is a huge chunk of wood missing? I never noticed that before. Now I am second guessing if I even want to continue with this project. At this point I don't know what I will do about that. I feel like a chair like this one, which has that perfect mix of good lines, modern fabric and some classic wood details was just what this room needed to tie everything together. I am putting this project on hold for now until I figure out what I will do. I have spent some time planning the built-in cabinet wall. 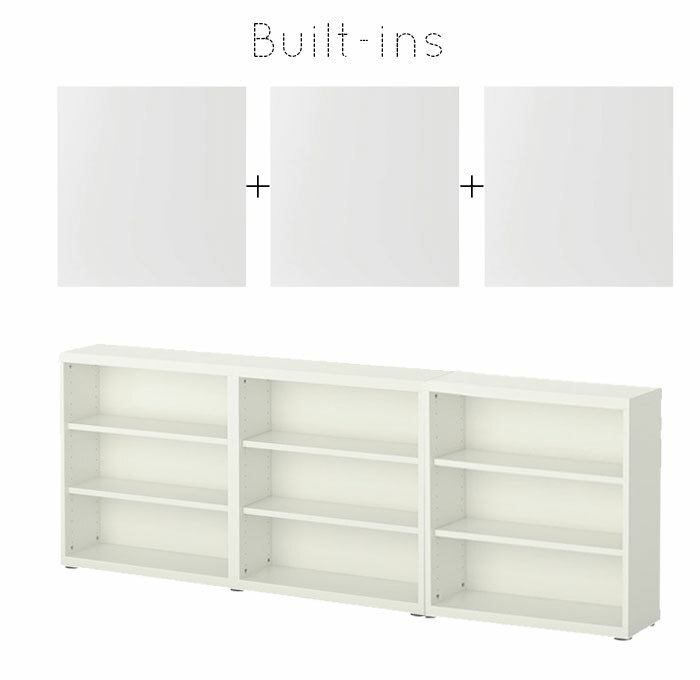 We usually use IKEA kitchen cabinets for this sort of thing, but I think we will go with the BESTÅ media cabinet frames and doors instead. They are just shy of 16 inches deep, which is the perfect depth for the space and it is deep enough to house a cable box. The plan is to put a double and a single cabinet together for 6 feet of built-ins onto the 8 ft wall. This will leave some room on either side and on the left that will be a good amount of space for the curtain (to be installed) to sit unobstructed. We are probably going to wrap this cabinet somehow to make it look more finished. I still need to figure out what we are doing for a table top. 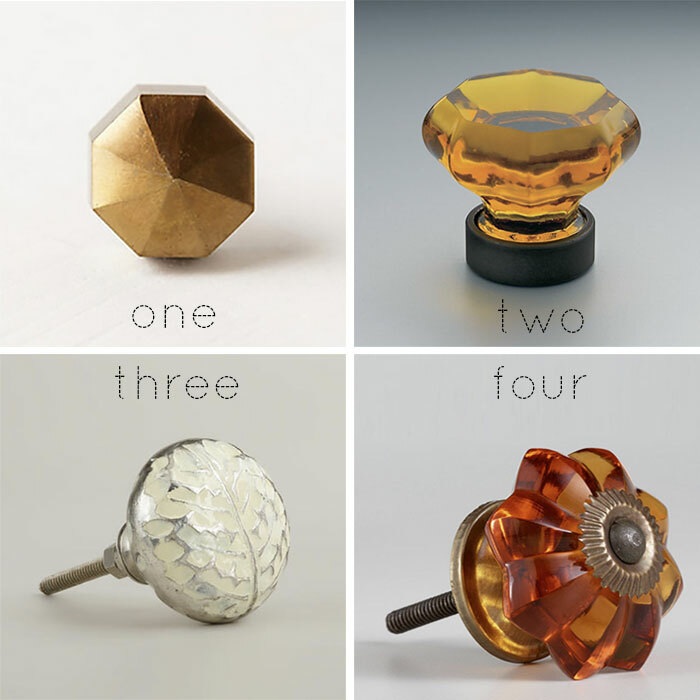 Here are some hardware knobs I am considering for the cabinet doors. Of course the most expensive one - number two - is my favorite. It is actually more expensive (15 dollars) than the cabinet doors (10 dollars). It sure is pretty though. Can I justify that price even though I only need three? We'll see. $279, but it's currently reduced to $223 and shipping is free. So far, so good right. I still do think that is a LOT of money for a mirror and when I went online to add it to my cart, I noticed that dreaded: $40 delivery surcharge. I just don't feel like I can justify that expense right now with all the other expenses we have going on in there with tiling, flooring etc. Usually you can get the mirror delivered to the store and get around the surcharge, but for some reason not this mirror. I just can't seem to get passed that $40 surcharge. Mulling this over some more. This week is going to be all about finding that tile and ordering it and talking to floor installers so we can get this show on the road. We can't begin the built-ins before the floors are installed. In the mean time I am going to buy a couple of supplies for some of the smaller projects for the room and get those going. 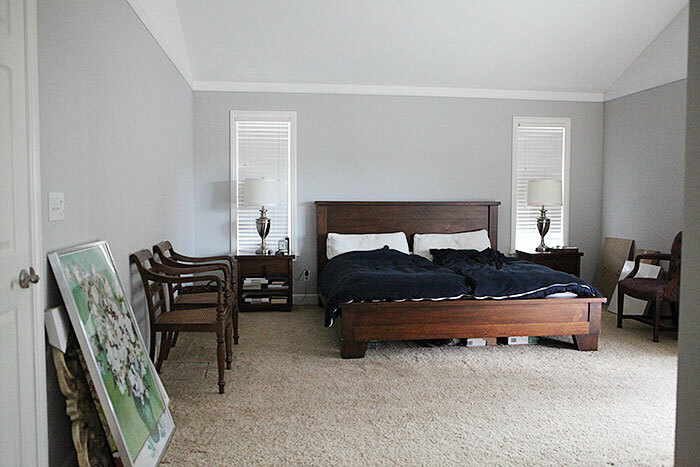 This article: Bedroom planning and a few obstacles first appeared on http://ahomefordesign.com.